Mr Muhammad Arshad Khan Lodhi son of Mr Irshad Hussain Khan Lodhi was born on October 1, 1937 at Jalandar, India. He graduated in 1959 from Government College, Lahore and obtained the degree of LL.B in 1966 from University of Karachi, Karachi. He is a practicing lawyer and an agriculturist. 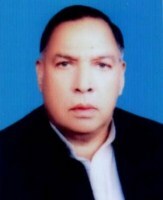 He served as Chairman, Union Council Harappa and as Chairman, Markaz Council Punjab during 1968; and as Member, District Council Sahiwal during 1979 and 1983. He has also functioned as Chairman, Crime Control Committee and Price Control Committee Punjab; as General Secretary, Pakistan Football Federation during 2003-07 and is serving as Senior Vice President of this organization since 2011. A veteran politician, who remained Member, Provincial Assembly of the Punjab during 1972-77, 1985-88, 1988-90, 1990-93, 1997-99 and 2002- 07. He has also served as Parliamentary Secretary, as well as Minister holding various portfolios including Colonies, Revenue, Relief, Industries, Mineral Development, Transport, Agriculture, Livestock & Dairy Development, Consolidation and Planning & Development Departments. He has returned to Punjab Assembly for the seventh term in general elections 2013.